Casa Bones Del Mar is our beautiful, Non-Smoking, upscale house with an enclosed heated pool and lanai on Estero Island - Fort Myers Beach, directly across the street from the beach. Our house is perfect for couples, families and family reunions. Our house is located mid-island and is in a quiet residential neighborhood. Fort Myers Beach offers miles of pristine sandy beaches, wonderful shelling, and a wide variety of water sports including jet-skiing, parasailing, swimming, fishing, and boating. (Jet-ski and boat rentals are available). And there is a community pool with water slides. All of these activities are within walking distance of our house. And there is world-class golfing nearby. Casa Bones Del Mar is the perfect home for your beach retreat. 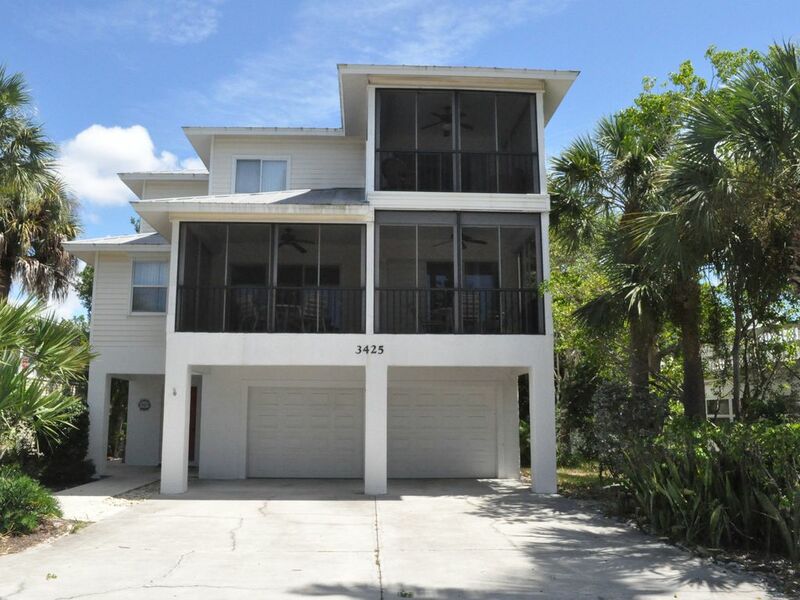 It is a large home located centrally on Fort Myers Beach. The house is directly across the street from the beach and offers views to the Gulf of Mexico from the upstairs balcony. The public beach access is only four houses away, a one minute walk. The kitchen has just been totally remodeled with new cabinets, granite counter tops and all new appliances including a refrigerator, dishwasher, microwave, stove/oven, coffeemaker, toaster, blender, silverware and dinnerware, spices, as well as all the gadgets you'll need whenever you are cooking in. We also have a Weber gas grill for outdoor cooking. If you prefer to dine out, there are many restaurants nearby. The family room has all new leather, very comfortable furniture, a large HD TV and a DVD player and a surround-sound home theater amplifier. The entertainment unit includes games such as checkers, Backgammon, chess, Monopoly, and playing cards. There is plenty of seating for everyone in the living room and balcony area. The dining area provides ample seating for your group. There is a large screened in enclosed balcony with two dining tables and fans off the dining and family room areas. Our house offers three bedrooms and three baths. All the bathrooms have just been remodeled. There is new furniture throughout the house and bedrooms. The upper floor has a large master suite with a king-size bed and a private balcony overlooking the Gulf of Mexico. You will have beautiful views of the Gulf of Mexico, Sanibel Island, and spectacular sunsets. There is also a large sitting area with a queen size sleeper sofa and a HD TV on this floor. There is a large master walk in closet. The master bathroom has a large shower and a sunken bathtub. The Manatee bedroom has a queen-size bed, and a picture of a manatee on the wall (cute). The third bedroom has a twin bed and a bunk bed (two more twin beds, three total). There is an additional queen size bed. There are ceiling fans and HD TV's in all the bedrooms. There is a queen size sleeper sofa in the master bedroom and in the family room. We also have a very comfortable queen size air mattress. The private screened in enclosed pool and lanai area has a large pool deck and a full size heated pool. Beach chairs and chaise lounges are provided as well as several tables and chairs for seating and to enjoy outdoor cooking at the bar b que. There is a covered porch area and cabana room for escape from the sun with a fan. There are some pool toys available. You provide the tropical drinks. Additional amenities include central air-conditioning and heating, a full-size washer and dryer, along with bed and bath linens. Beach chairs and beach towels are available for you to use. There are wagons and coolers on wheels provided to get your things to the beach. The beach is a short one to two minute walk from our house. There are restaurants and beach activities such as parasailing and banana boat rides within a short walking distance (two blocks). The downtown Times Square entertainment distict is only a 3/4 mile walk or drive from our house. There you will find many excellent outdoor restaurants and bars, both gulf side and on the back bay. There is an information book in the house which provides information on what to do, where to go and best restaurants. The free beach trolley stops in front of our house. A new Publix Supermarket, a drugstore, movie theater, and shopping are minutes away by car or island trolley. Please review our collection of local restaurant menus and brochures describing Fort Myers Beach and nearby tourist activities. Driving times to major cities include: Fort Myers, Sanibel Island and Bonita Springs (15 minutes); Naples (30 minutes); Miami and Tampa (two hours); and Orlando, Disney World, Universal Studios, and Cape Canaveral (approximately three hours). Please call for more pictures and information. To assure your reservation, please reserve our beautiful home today. it’s easy to get to and from the airport. it has 10 miles of beaches. Our house is located mid island across the street from the beach. Our property is 1/2 mile from the Mantanzas Pass Nature Preserve, a 56-acre Natural Habitat Park with walking trails and several stops where one can sit and enjoy the beauty of the back bays and watch the dolphins at play. Our hose is right next to the City park with large heated pool and pool slides and tennis courts. Our property has beautiful tropical foliage and live oak trees. The beach is a short one block (1200 feet) walk to the public beach access. Our house is a short 3/4 mile walk to the Times Square Entertainment District where you will find many outdoor restaurants and bars. At sunset pier you will find local comedians and entertainers as you watch some of the most spectacular sunsets in the world. You can fish off the pier with the local fishermen. You can also take a sunset cruise on a sailboat or a pirate ship. le. The Bay Oaks Recreational Facility is one-half block away and has tennis courts, basketball, and a large community pool with water slides and lifeguards for the kids. All of these activities are within walking distance of our house. And there is world-class golfing nearby.